On Sunday 17th September 2017, Paul and Kevin rode a tandem bike 54 miles from London to Brighton for Keech Hospice Care, one our partner charities at Tandem Financial. Watch the highlights from the day. 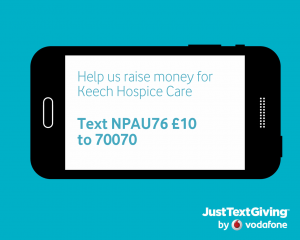 You can DONATE by clicking HERE or you can text NPAU76 £10 (or any amount) to 70070. See the picture for an example.